"Tits4Freedom": in addition to all news, stories, and theories about FEMEN, FEMEN.TV is bringing you their best videos. Make sure you are 18+ or have parents consent for standing by. 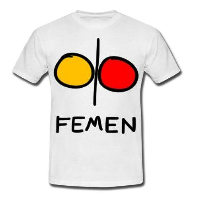 FEMEN.TV is only about video coverage and FEMEN actions only. With more than 100 thousand of recorded FEMEN related videos globally, this site aims to sort 99% of them and bring you the top 1%. Contacts and video submissions via infoatfemendottv.